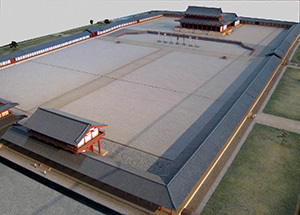 Empress Genmei moved the capital of Japan to the new planned city of Nara in 710 AD. She wanted the move to help get more power into her own hands and out of the hands of other powerful Japanese families. Genmei succeeded in stopping a revolt in 709. To guard against future revolts, Genmei improved several key roads. She also encouraged the publication of Japan’s first historical chronicle, the Kojiki. And she helped to publish Japan’s first geographical and botanical encyclopedia, the Fudoki. Islamic scholars were doing the same thing in Central Asia. The invention of paper and wood-block printing encouraged a lot of reading and writing books in T’ang Dynasty China too at this time. By 715, Empress Genmei was 54 years old. She retired, leaving power to her daughter, Empress Gensho. Gensho was the third Japanese ruler in a row who was a woman. Gensho had a second major history book published, the Nihonshoki. But the rich were getting richer, and the poor were getting poorer – and so was Japan’s government. Rich, powerful families were taking up more and more of the wealth. The families were fighting among themselves to control the empresses. Gensho tried to raise tax revenue by encouraging farmers to farm land that wasn’t as good for farming, but (as usually happens) this wasn’t a big success. In 724, the increasingly powerful Fujiwara family forced Empress Gensho to retire at forty. 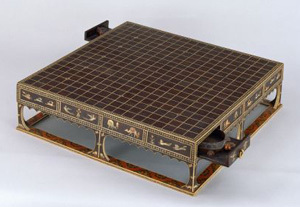 They set her nephew Emperor Shomu on the throne. Shomu’s mother and wife were both from the Fujiwara family, so they got a lot of power. But then a terrible smallpox epidemic hit Japan in 735, and all four leading Fujiwara ministers died of it. Emperor Shomu took advantage of the opportunity to push the Fujiwara family out. He got more power for himself and his Tachibana family. Japan’s people were poorer and poorer thanks to the rich families getting more of the good land, and then the smallpox epidemic and a drought. Shomu helped ordinary people by hiring thousands of poor Japanese people to work building a huge Buddhist temple complex. The Fujiwara, and other rich families, didn’t like paying high taxes to pay for the construction, and they revolted, but they lost. Shomu ordered lots more temples to be built all over Japan. When he was 48 years old, in 749 AD, Shomu also retired and became a Buddhist monk, leaving power to his daughter, Empress Koken. Empress Koken ruled until 758, but then the Fujiwara family led another rebellion, and she had to step down. The Fujiawara excuse mirrored the one that had just been used by An Lu-shan’s successful rebellion in China: they accused Koken of being dominated by her boyfriend, the Buddhist monk Dokyo. By 764 the Fujiwara were defeated again, and Empress Koken (still with Dokyo) took power again. Like the earlier Nara period empresses, she published books; this time wood-block printed Buddhist prayers tucked inside small wooden pagodas. Like her father, Koken worked to redistribute wealth to ordinary people. She ruled until she died in 770 AD, at 57. Cite this page: Carr, K.E. Nara period – Early medieval Japan. Quatr.us Study Guides, July 27, 2017. Web. April 23, 2019.